After a thorough study of company literature and other available information, the Healthy Building Network determined that the most toxic sealant among the six types examined is the one-component spray polyurethane foam, which is laden with isocyanates (at 30 percent by weight on average) and a chlorinated flame retardant (10 percent by weight). The two most commonly used isocyanates—Methylene Diphenyl Diisocyanate (MDI) and Toluene Diisocyanates (TDI)—can cause cancer and asthma. They serve to activate the process to create the foam and produce the final sealant/insulating product onsite during application. Meanwhile, TCPP—the flame retardant in SPF—is a persistent bioaccumulative toxin—meaning it never breaks down in the environment and builds up concentration in humans and animals. Though regulators have not yet restricted TCPP, the chemical is structurally similar to other chlorinated flame retardants that are recognized carcinogens, mutagens, reproductive and developmental toxins, neurotoxins and endocrine disruptors. Falling into the next tier of hazardous materials within sealants/caulks are one-component moisture-cured polyurethane sealants, MS polyether sealants and solvent-based butyl caulks. They each contain about 20 percent toxic content. These determinations are based on an inventory of typical products and their contents. Not every product in each category will have the identified chemicals in them. Acrylic latex caulks are among the least toxic types of general construction caulks. A water-based product, acrylic latex caulks have virtually made solvent-based acrylic sealants obsolete. However, butyl caulks are still high in a carcinogenic solvent (about 20 percent). Butyl caulks are used primarily in locations that take advantage of their waterproof nature, such as gutters, flashing, chimneys and aluminum and vinyl siding. *As estimated by Health Building Network’s review of common and frequent chemicals in the composition of those products. 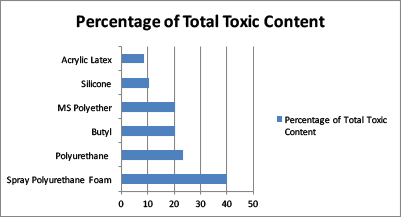 Where the toxic content percentage was a range (for silicone and acrylic latex), the highest number was used. Solvents are one of the key components within sealants and caulks that are dangerous for occupants and installers. Solvents off-gas toxins or volatile organic compounds (VOCs) into the air. When inhaled, VOCs can in the short term cause nausea, irritation to the eyes, nose and throat, loss of coordination, fatigue, dizziness, headache, allergic skin reaction and other problems, according to the EPA. Depending on the type of solvent in use, long-term hazards range from cancer to genetic mutations to developmental and reproductive harm. Some common solvents are the Stoddard solvent, mineral oil, toluene and xylene. Government regulations and green building initiatives to reduce VOCs have put a spotlight on the issue. A key component of sustainable buildings is indoor air quality. Manufacturers are moving to reduce the amount of solvent used, but solvent remains in many formulations. Despite their comparatively high cost, silicone sealants are used eight out of 10 times in the construction market, in part because their low VOCs enable builders to earn green building credits. Another material that carries warnings are the fillers used in sealants and caulks. Silica is one of the most common. It initially can cause irritation to the eyes and nose but eventually could lead to cancer. An even more worrisome filler is talc, which can contain asbestos. 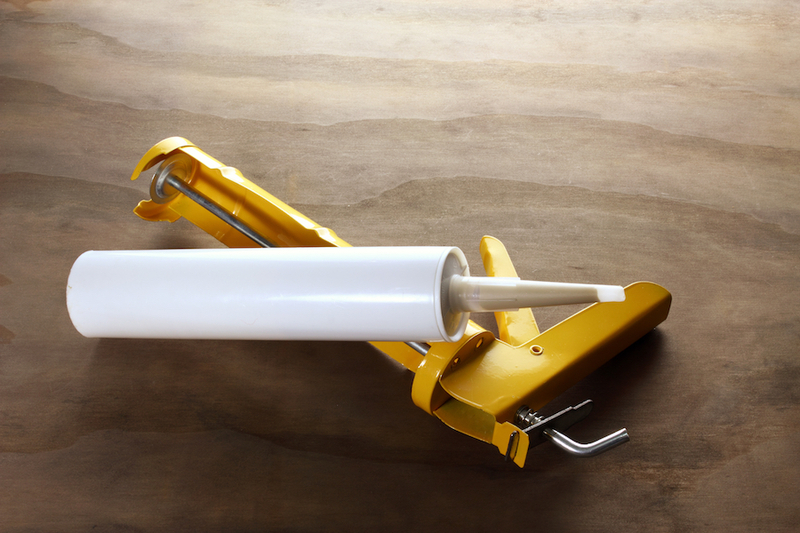 Talc is commonly used in butyl caulks and polyurethane sealants. Even products—including sealants—labeled asbestos-free have been found to have asbestos. It is unclear how frequently the sealant industry tests its talc for asbestos, but its presence when testing occurs suggests it is possible that talc supplies for building construction are contaminated. There is a common assumption put into product advertising that MS polyether sealants are healthier than polyurethane or butyl caulks because they are solvent- and isocyanate-free. However, most MS polyether sealants contain a lot of phthalate plasticizer—about 19 percent by weight. They also use UV absorbers and catalysts that are persistent bioaccumulative toxins. Good news comes from the growing trend to eliminate use of phthalates as a plasticizer to reduce brittleness in the final product. Phthalates are typically in MS polyether, polyurethane sealants and acrylic latex caulks. Healthy Building Network discovered that a majority of building product manufacturers were substituting a dibenzoate plasticizer, which in usually much less toxic than phthalates. While toxic content in acrylic latex caulks is proportionally lower than in many other types of sealants and caulks, some of the ingredients are of high concern even at low thresholds. Fortunately, most of the high-hazard content can be designed out. When seeking acrylic latex products, look for products that are free of formaldehyde, styrene and phthalates.